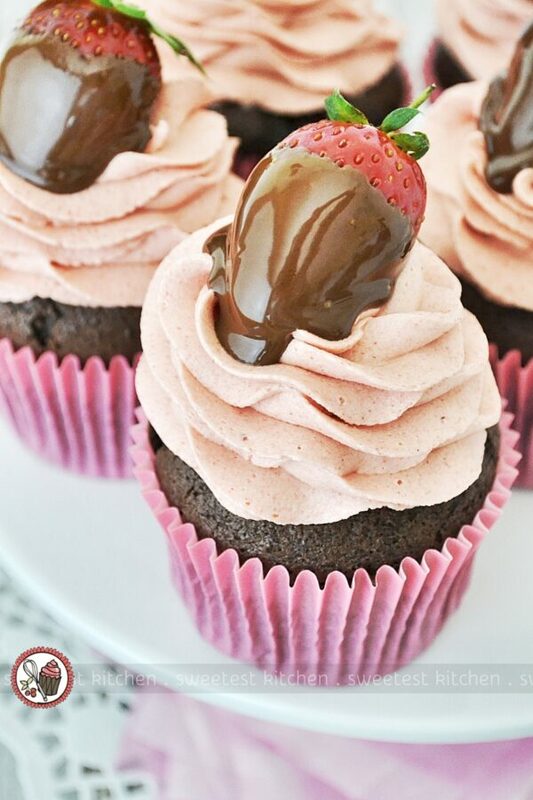 An easy (and eggless) recipe for chocolate-covered strawberry cupcakes, with a chocolate cake base and naturally-flavored and -colored strawberry buttercream! 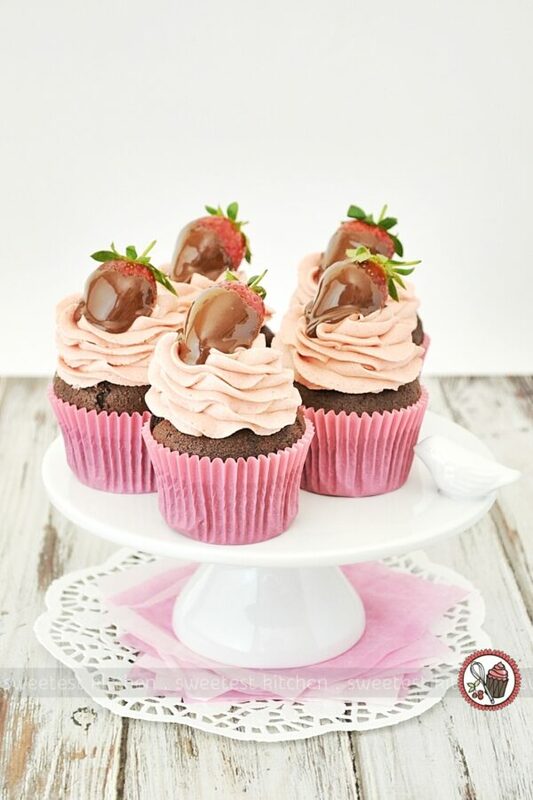 You’d never believe it, but I’ve had this recipe for chocolate-covered strawberry cupcakes waiting to be posted for a couple of months now! I’m not sure why it’s taken so long to get around to posting it, but here it finally is! These gorgeous cupcakes start with a chocolate cake base, which is the easiest and best recipe ever. It’s your average wacky cake/crazy cake/dump cake recipe, but I swear by it – it is awesome! This recipe makes the softest, fluffiest cakes, or if you under-bake just slightly, it’s amazingly fudgy. The chocolate flavor is intense and wonderful if you use the best cocoa powder you can get your hands on. Use Dutch-processed for the ultimate experience! I use Van Houten cocoa powder, and highly recommend it. The frosting is a very basic buttercream that is flavored and colored naturally with freeze-dried strawberry powder. True, the frosting isn’t very pink, but if you don’t mind, you could always just add a bit of pink food coloring to pink it up a bit. I was going for a more natural look, so I skipped the food coloring. The key to this buttercream is to whip the heck out of that butter; it’ll start out kind of yellow-ish/off-white-ish as you add the powdered sugar, but keep whipping it at high speed, as per the recipe, and it’ll turn beautifully white. When I added the vanilla to the buttercream, I also added about 3 tablespoons of the freeze-dried strawberry powder (I bought it in powder form, but if you can only find whole or sliced, just whizz them in a food processor until they form a fine powder). It wasn’t quite enough, so I added a tablespoon or 2 more, so definitely taste and adjust before you pipe the frosting on the cupcakes. Again, if it’s not pink enough for you, just add some pink food coloring. Alternatively, if you can’t find freeze-dried strawberry powder, artificial strawberry flavoring would work as well; you’d definitely need to add pink food coloring if you use the flavoring. Finally, the strawberries! These are super simple to make and really give these cupcakes the ultimate wow-factor. All you need to do is melt some chocolate and dip in the strawberries. 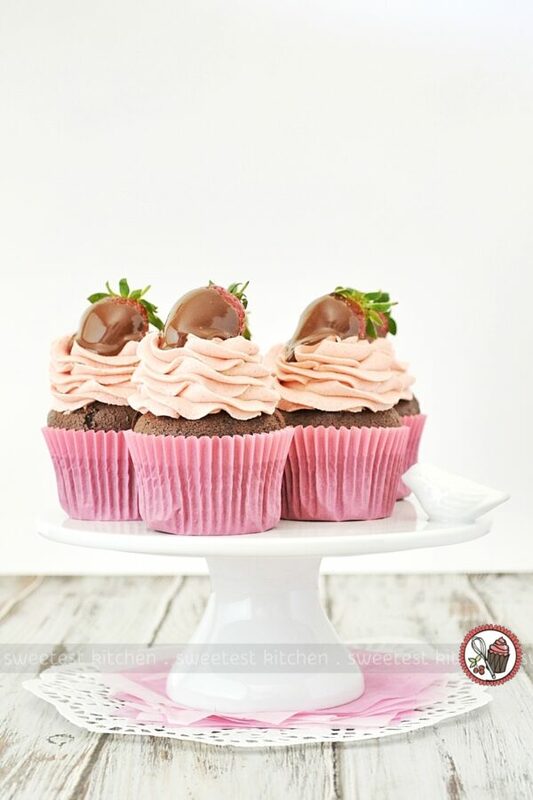 No need to set them aside to let the chocolate set; just sit them right on top of the buttercream! You’ve got to agree, these cupcakes are really beautiful! Not only are they visually appealing, though; they also taste amazing! I took these to share with some friends, and even gave a couple to one of the teachers, at school pick-up. Their reaction was priceless – a smile immediately spread across their face when they saw them; they loved these gorgeous cupcakes! This is definitely the recipe to make when you want to make someone happy and feel appreciated! 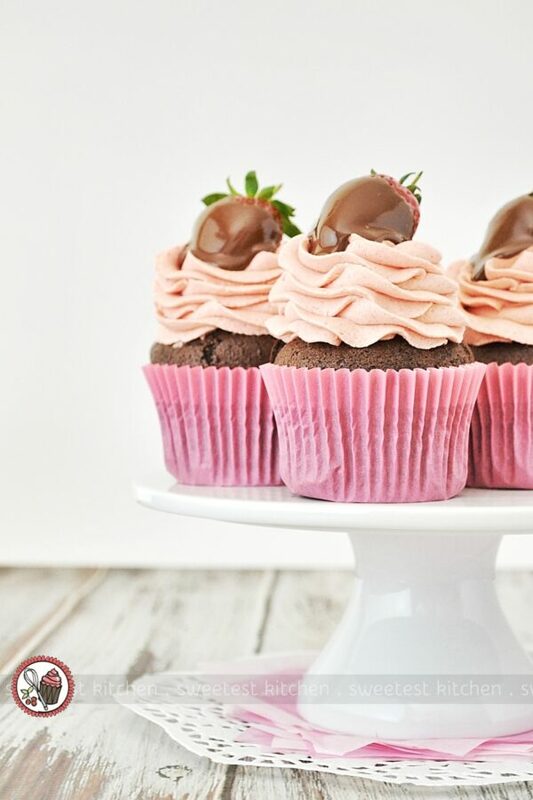 A simple chocolate cupcake recipe with naturally-colored and -flavored strawberry buttercream, and of course, topped with a chocolate-covered strawberry! For the buttercream: In a stand mixer, beat butter with the paddle attachment on medium-high speed until pale and creamy, about 2 minutes. Reduce speed to medium. Add sugar, ¼ cup at a time, beating after each addition, about 5 minutes. (After every 2 additions, increase speed to high, and beat for 10 seconds, then reduce speed to medium-high). Add vanilla, strawberry powder and a few drops of food coloring, if using, and beat until buttercream is smooth. Taste before finishing; beat in more strawberry powder and/or food coloring, if desired. Pipe onto the completely cooled cupcakes. For the strawberries: Place the chocolate in a heatproof bowl over a pan of barely-simmering water, ensuring no water gets into the chocolate. Stir occasionally until completely melted. 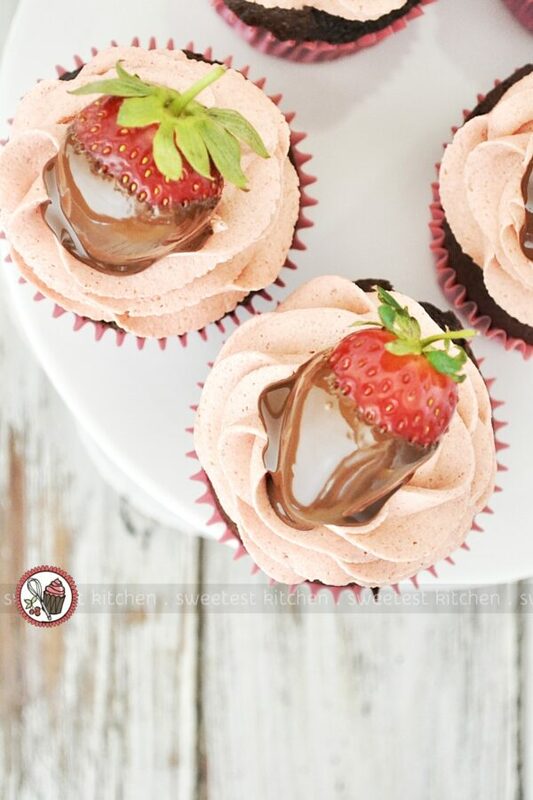 Let cool to room temperature, but don't let it firm up; you don't want the chocolate to be too hot, or it will melt the buttercream, but it still needs to be liquidy so it'll be easy to dip the strawberries into. 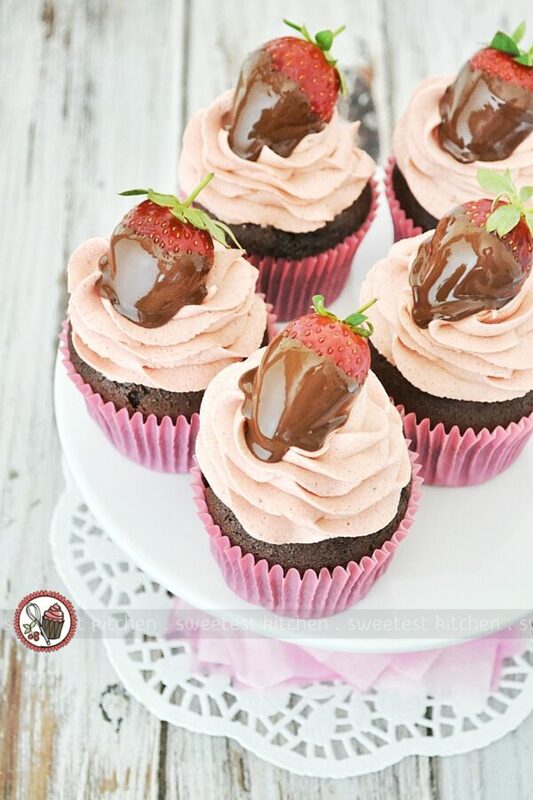 Dip the strawberries (be sure they are completely dry, as any water will cause the chocolate to seize) into the chocolate, one at a time, scrape off the excess chocolate and carefully place on top of the frosted cupcakes. 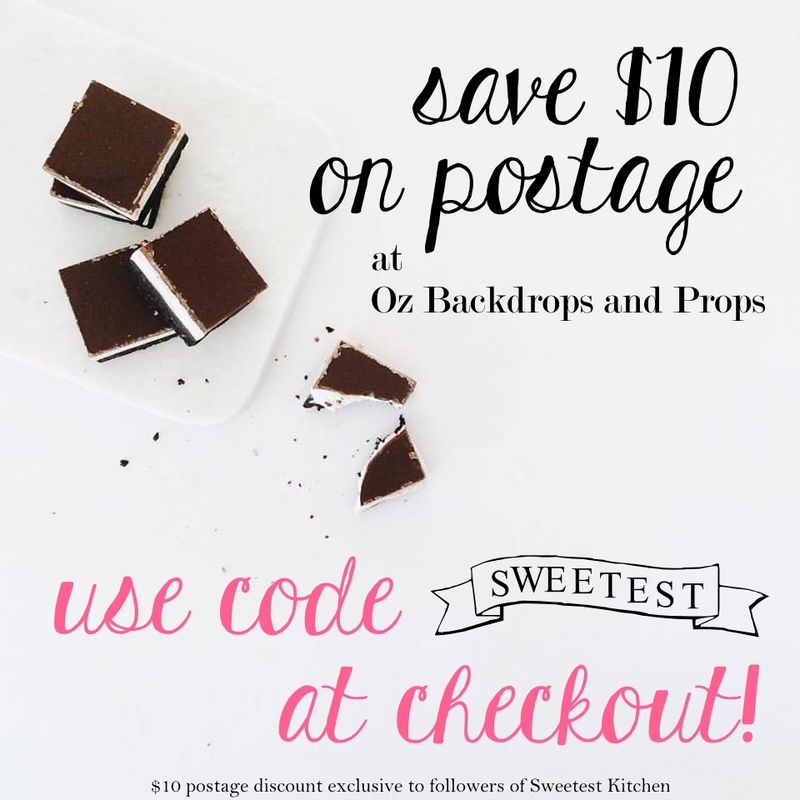 Set the finished cupcakes aside to let the chocolate set; alternatively, place them in the refrigerator briefly to help the chocolate set quicker. Will keep in an airtight container for up to 3 days in the refrigerator. Use a high-quality Dutch-processed cocoa powder in the chocolate cupcake recipe for a more intense chocolaty flavor; I use Van Houten. Note that this cupcake recipe produces a cupcake with a high dome. If you prefer, feel free to cut the dome off, with a sharp, serrated knife (using a sawing motion) once the cupcakes are completely cooled.